It’s great being back in the office, with energy and motivation to make things happen in 2019. On a personal level, our 2018 Christmas was really special because it was our first as a newlywed couple. We mixed old and new elements from our very different upbringings and designed our own “traditions”. It was also the first proper holiday I had in 2018 where I actually managed to disconnect from all devices and gain fresh energy and perspective on my goals for this year. Setting intentions and goals is something I have been doing since I was 14. It was my best friend’s father that inspired us to write them down. I remember even now sitting in their living room and handwriting my teenage goals on a piece of paper. I would close my eyes to visualise what accomplishing my goals would feel like. And almost always I think my first wish was to do well in school… I’m sad to have lost those pieces of paper along the way, but the feeling will stay with me forever. This year I’ve added a layer to this goal-setting exercise, going beyond personal goals, and including my business in the process. In the last days of December, I set aside time to reflect on how generous 2018 was with me and to also think about what I want 2019 to bring for me and my team. We’re present across several channels whcere we share valuable content and insights with our community. Specifically, I want to stay consistent with publishing blog posts (1 per week) on a range of posts around communicating research, like the one we did last year about three times research made the news and why. Moreover, I want us to keep building our Twitter community, where we engage with researchers and their work, share news and find interesting events. We also use it as a tool to live tweet from events we take part in and follow cool hashtags like #scicomm. How about joining us at @researchretold? Lastly, I am keen to grow our Research Retold LinkedIn page as a dedicated space for articles about science and research communication. For example, this week we shared a thought-provoking article authored by Dr Meredith Whitaker about how science communication is about trust, not information. I know that consistency is key when it comes to creating content and it’s our intention to stay on track and keep bringing value to our audience. Following on from the first point, we want to be more intentional about the community we are building and for Research Retold to be the go-to space for people who are excited about making research accessible. In 2019, we will specifically engage with researchers doing amazing things (see our post about reaching out to authors from The Conversation) and learn more from them. It’s great to see our community growing with real, interesting humans that care about what we do, rather than bots and fake accounts. Our guide will be crucial in this goal, and we plan to spread the word about it in a targetted manner to researchers in the UK to generate more fruitful collaborations. I get the biggest smiles when researchers tweet us photos, saying they found the guide useful. Like the lovely Dr Smith-Wooley and Dr Gunn. Get your very own copy and grab a few of the limited free downloads available on this page! In September 2018 I started an internship programme for graduate students at the University of Leeds to gain experience in content marketing and communication. We’ve successfully completed the first cohort with three students, Anca, Stephen and Isabel (the last one standing for a few more weeks). I plan to continue this scheme in 2019 and mentor more young people to gain experience and valuable skills. Moreover, I’m exploring the possibility of hiring a full-time graphic designer in 2019 to help us deliver work for our clients and collaborate with more researchers. This is a really scary but exciting step for me and I will have to work hard and smart to make it happen. Lastly, I’m excited to grow our network of 13 research communication specialists. Our associates work all over the UK, so I would love to organise a team day for all of us to get together, do some fun, stimulating activities and brainstorm plans for the future. This may sound odd, but I love public speaking. Or I should say, I’ve learned to enjoy it and worked hard to leave behind my former 5-year old self that would cry in kindergarten when reciting a poem about Santa. I enjoy creating a connection with an audience and the tingling sensation that makes my mind sharp. I’m keen to take advantage of speaking opportunities where I can share my knowledge about the value of communicating complex data and information in accessible ways. This month we have two exciting opportunities coming up: I will speak at the Women’s Budget Group Early Career Network launch event in Manchester on January 24th on a panel about “Communicating Research”. Moreover, Isabel, our Content and Engagement Executive, and I will attend the New Entrepreneurs Foundation Demo Day in London on January 29th. We will have a stall there to engage with people and I will pitch in front of an audience of over 450 donors, supporters, alumni community and beyond. Exciting! The New Entrepreneurs Foundation holds a special place in my heart. 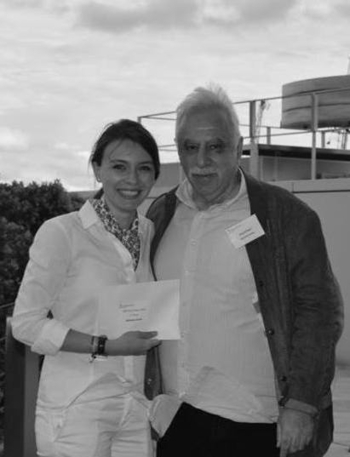 I got my first big confidence boost to start my business when in June 2016 I won the £3500 David Pearl Prize (see photo on the right). Plans to deliver more of our “Communicating Research Beyond Academia” workshops are also underway with (fingers crossed) the University of Sheffield and Warwick. Feel free to email me directly at mihaela@researchretold.com if you want to know more about this. We are humbled to be working with world-class researchers whose work makes a real difference in policy and society. In 2018 we worked with 55 researchers across 7 UK universities. We’ve had amazing success in creating interesting and appealing visual summaries, policy briefs and infographics that were used as tools to make a difference. In 2019, we are hoping to target more researchers in high-impact areas, such as, but not limited to, environmental, mental health and STEM research. We are keen to amplify the voices of these researchers and to help them create positive social change. Moreover, getting involved in more community projects in Leeds like the Thriving Minds Conference (we put together a short, funny video about it), that have a strong sense of purpose, is something close to my heart that we want to keep doing in 2019. 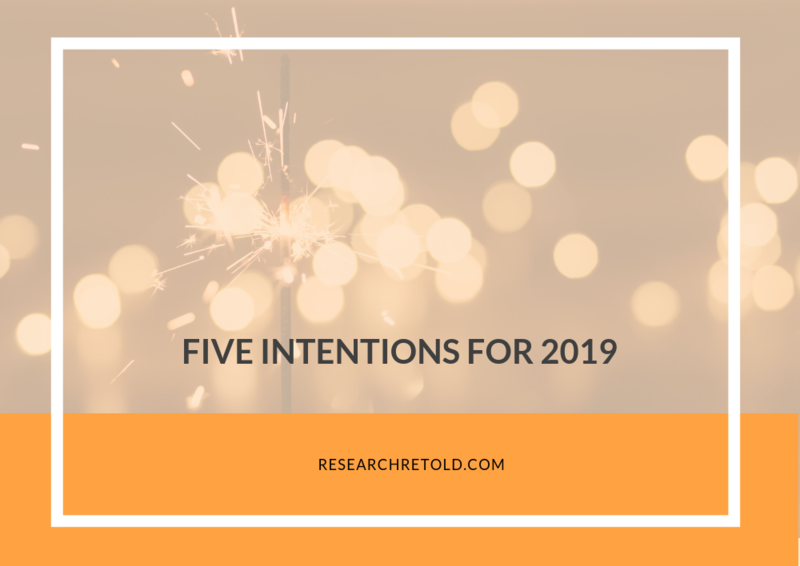 Thank you for reading this post about our five intentions for 2019 and for following along with our journey. I am excited to take each day at a time, with a sense of possibility in my heart that every day will bring something new to learn and grow from.